Since I was going to spend majority of time creating land art I wasn't sure what kind of landscape and materials I would encounter. I took little time to get to know the landscape, the shapes, colors; to respond to what surrounds me and as I would call it "say hello to the land". Walking along the banks of the Yampa river I noticed pieces of coal laying about embedded into the river bed, among the stones and sand. It was the first material that drew my attention, stark contrast of black against the light colored sand. Coal is somewhat controversial topic in the community, there's also a coal plant near by. The pieces I created dealt with symbolic meaning of coal, how it relates to the issues of energy and the Earth. There was an abundance of other materials as well: soil, sand, cottonwood scattered everywhere, bleached by sun resembling the bones, stones from the river bed, grasses. Some of the cottonwood I borrowed from beaver dams that were taken apart by withdrawing river. Besides the materials, the place immensely influenced my work. The sheer expanse of the river valley, its openess and non-urban environment allowed me to go larger in my work, as they would say go bigger or go home. I saw evolution in my work, in size, scope and the themes as well. For a while I've been looking to into incorporating fiber into my work which I did. It's something I will keep exploring. I processed the landscape in drawings as well. I was trying to get its pulse, the feel of the land and see how I respond on paperl. This residency had quite an impact on my work. Colorado landscape, its colors and the quality of light left me in awe. I hope to have an opportunity to go back West. First I'd like to thank again Grant and Peggy from Colorado Art Ranch, who brought us together for this residency. Thank you for selecting us, for your generousity and laughter. Jim as well, previous resident and current board member, for the stories he shared with us. I already mentioned in my previous post some the key characters: my fellow artists Tama and Necole, and Betsy and Geoff, who live on the rach. Huge part what made the residency great are the people I met there and hope to see again. In the field: Necole with Dusty bucket and Tama with her kite. Necole's masterpiece—the best pumpkin pie I ever had. Period. Some of the best times I had with fellow artists were around the kitchen table, talking away about art, life, food and other random topics. Favorite meals for everyone it seems like it was breakfast. Culinary skills galore and coffee, always coffee. Dinners would get out of hand (see below). Often conversations would continue in the living room where each one of us had our usual spot. We formed a triangle as Necole would call it, a very strong composition indeed. Yes, we are making photograms for dinner. N's ceramic pieces are on the right. I must not fail to mention other people we met in the local community specifically Tammie and her husband Patrick who own an amazing local coffeeshop situated in Hayden granary. We visited their ranch few of times. 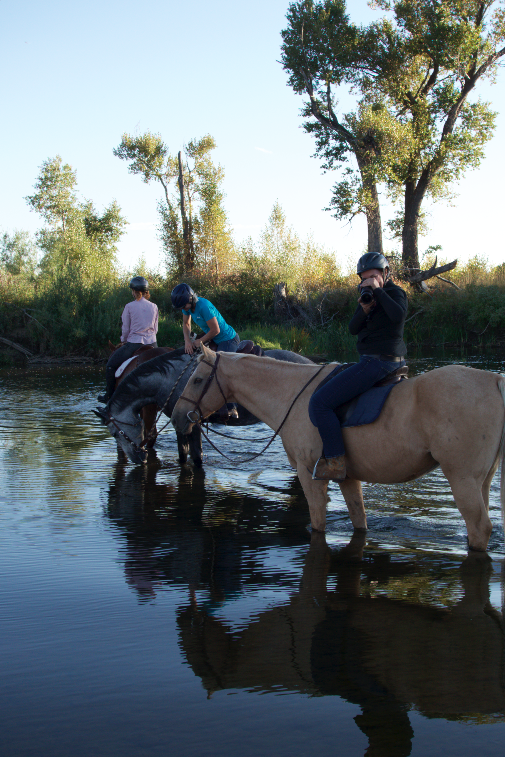 My fellow artists got to ride horses and I got sit on a horse for a first time in my life! Thank you both for having us over for dinner and sharing your stories. Left to right: Necole on Chance, Tammie on Mesa and Tama on Dusty. View nearby Tammie and Patrick's ranch. I enjoyed company of animals a plenty, especially Jorgy, the protector husky would accompany me often to my daily pilgrimage to my "studio" at the river. I miss her so. She would always run ahead and then turn to check on me, as she was saying c'mon catch up, I gotta to go swimming! Oh there were three resident cats, occasional mouse and garden snakes too. I would be amiss if I didn't mention cattle, whose presence is huge in the region and on the ranch (as part of it is leased). However, the "wild life", was present in abundance to be heard and watched. Sandhill cranes, bald eagles, beavers, elk just to name a few. Elk are elusive, coming out at dusk, their bugling heard from far away—beautiful, but a haunting sound. I miss it all very much, the sounds, but also silence as well. Stayed tuned for Part 3: The Art Process or Go Bigger or Go Home. "How was your Colorado residency? ", you ask. Well, let me tell you, how much time you got? This won't be very long, just in three parts. The ranch and its surroundings: I couldn't get enough of...well everything. Soon enough, everything was ridiculous, meaning amazing, beautiful: the light, fresh (dry) air, smells, I could go on. The first night at the ranch involved some great conversations, even greater laughs while sipping scotch under the clear Colorado sky. We were all getting to know each other and getting new nicknames to boot. I fell in love with quality of light and sunsets on the mesa. On our second night we were welcomed by friends in the local community. There was a delicious potluck and the amazing views of the setting sun. It was the first time I tried elk and yak kabobs. Well, maybe there should be a whole another post about food...it was ridiculous. Our great host at the ranch, an amazing help with just about anything, and the great source of information was Betsy Blakeslee. She and her husband Geoff welcomed us and I felt like we had a new "family". We had many great conversations around our kitchen table and beyond. Betsy gave us a tour of the ranch, ranch etiquette (leave the gate just as you found it), told us the history of the ranch and how it fits into the context of today. Not to forget, we were given top secret location of good swimming holes. First tour of the ranch with fellow artists Necole, Tama and Betsy, the ranch manager...and not to forget the ever faithful companion Jorgy, the resident husky. On my daily walk to my studio (the banks of Yampa) I saw many amazing views...this was my favorite. The smooth surface beautifully reflected trees and the sky. From here on I'll let pictures tell the story of the ranch and some surrounding areas. Sage bushes across the road from the ranch. The ranch meadows have an abundance of downed cottonwood trees. They appears stark white, bleached by the sun, resembling bones thrown about by some unknown beast. The gnarly, twisted branches and texture of stripped down of trunks kept drawing me in. Stay tuned for Part 2: People, Animals and Power of the Triangle.